Several job seekers sharing recruitment information. 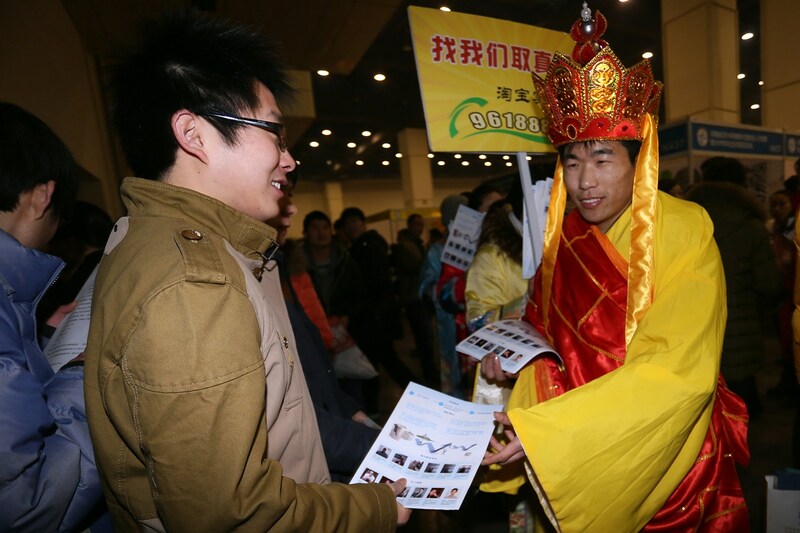 A recruitment fair worker dressed as Xuanzang distributing materials to job applicants. 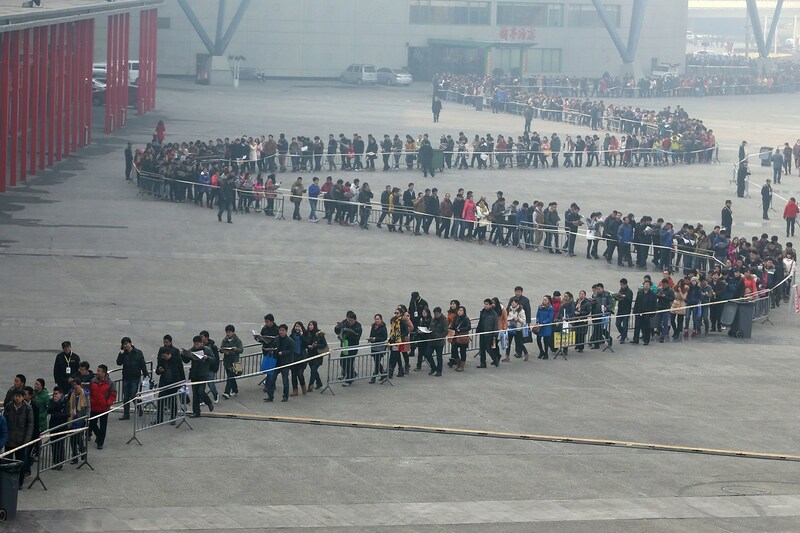 The descendants of the dragon [referring to Chinese people]: Folding the dragon robe [imperial/emperor’s robe] in their sleep, standing in a dragon line [long line] in their hopes, racing dragon boats in reality, bowing their heads in helplessness. What a difference from last night’s spring night and today’s reality. I hear a lot of people in Shenyang have just returned from Guangzhou, hahaha. Hehe, when it Henan, is there any need to report it? What would it have been like without railings/fences? Build another Foxcoon [factory] and their unemployment will all be solved. Is that smog? Or smoke? After all these years of work, I’ve increasingly realized: In society, even if you are Superman, a single person’s strength is ultimately limited, and only by joining a circle/group can you warm yourself. A single person can walk very fast, but a group of people can walk even further. Wealth is just passing clouds, and only friends are your bargaining chips. Job hunting is hard, recruiting is also hard, a vicious cycle! Is big Henan’s Zhengzhou also cracking down on prostitution? Do the job applicants happen to be mostly female? Are they recruiting for civil servants? 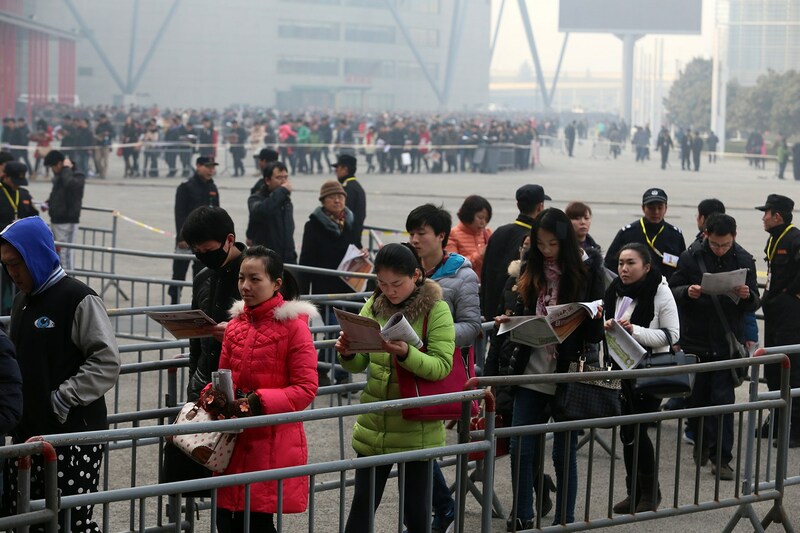 There’s almost 48,000 who just returned from Dongguan. Born as a Chinese person [national], how much smog we breathe and how much garbage food we eat are things we are already powerless to change, but here I sincerely hope that after they find jobs they can afford to pay their home loans, have people to take care of them in their old age, and can afford to get medical care. Someone at home waiting for work passing by. My girlfriend has worked in Dongguan for nearly 2 years, and had just returned to Dongguan on the sixth day of the new lunar year to work. This morning, I suddenly received a call from her, saying her company has gone bankrupt, that she won’t be able to work anymore, and is now planning to return to Nanjing to marry me. I had just talked about marriage with her over the [Chinese] new year holiday, but at that time, she had just said that we should first make money for two years and then get married. Who knew that her company would shut down so soon, but this is a good thing too. My girlfriend is very pretty, and always having her out there [working] also makes me worried. She says she has already bought tomorrow’s train ticket back, and will attend to the marriage matters once she’s back. Everyone wish us the best. Do we still want to extend/postpone the retirement age??? Of the 50,000, those who truly have ability are but a few. I’ve seen those who complain everyday about their jobs, about how their wages and benefits are lousy, but there aren’t more than a few who have any ability. 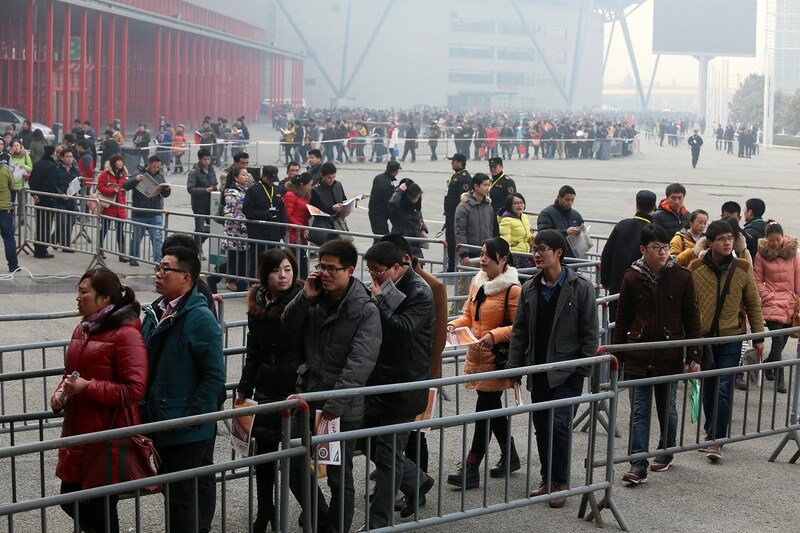 China has never lacked for people, only for talent. 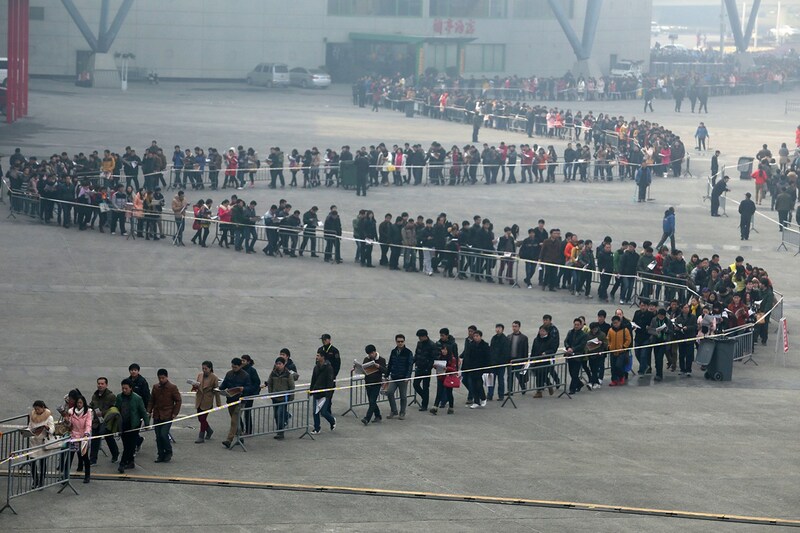 Lined up so orderly? I don’t believe it!! Let me tell you a truth and don’t yell at me for it, because I’m not maliciously slandering. A large proportion of the CVs our company gets in applications are from people from Henan, but a lot of companies do not consider people from Henan at all and our company is the same. 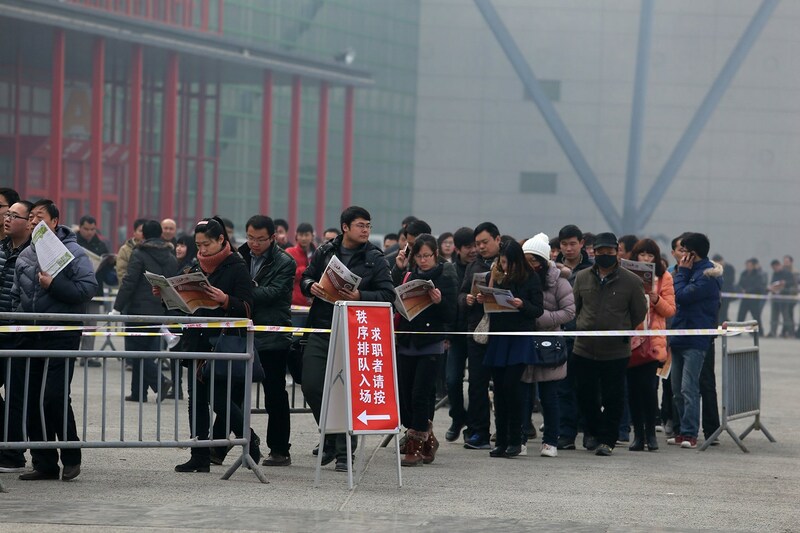 As long as you’re from Henan or Jiangxi, you will uniformly not be considered. Don’t tell me about painting everyone with the same brush, I know that some people are good, but who is willing to take the risk? 50,000 people. Even if every person only occupies 30 centimeters (0.3 meters) from front to back, that woul still be 15,000 meters. How was a hundred meters calculated?